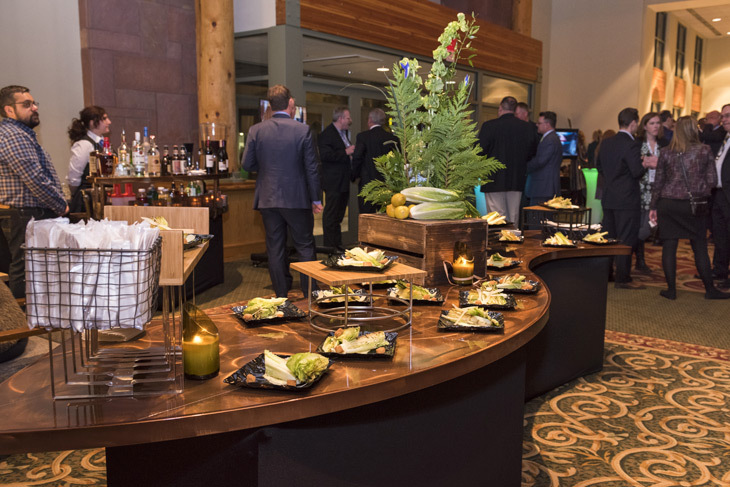 The Ridgeline Hotel, located in picturesque Estes Park, CO, is the perfect location to hold your next industry or corporate event, whether you are planning a large-scale company conference or an intimate boardroom meeting. The Ridgeline connects directly to the Estes Park Conference Center, and is equipped with all the services and amenities you would expect in a full-scale event complex, including on-site catering, audio/visual equipment, and over 20,000 square feet of meeting and event spaces, both indoors and outdoors. You will also have access to a wide range of recreation and team-building activities, including group tours, golf tournaments, and a variety of on-site amenities like our heated indoor pool and hot tub, and our complimentary game room. Whatever the size, whatever the occasion, if you are looking for a professional venue for your upcoming event, The Ridgeline can create an elevated and inspiring conference setting. For more information, or to begin planning your Estes Park conference, call our event staff at 970-480-4012, or send us a Request For Proposal. Here at The Ridgeline, we have a function space for every occasion. 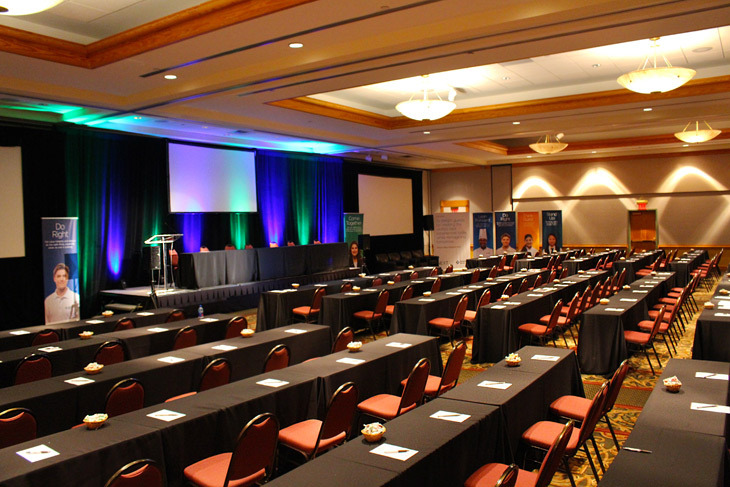 For large-scale events, our 8,000 square foot Grand Ballroom can accommodate up to 650 attendees, and can be divided into as many as six separate areas depending on your needs. A variety of foyer and lounge areas surround the Grand Ballroom, which are perfect for hosting breaks and receptions, and a number of smaller meeting rooms are available for staging breakout sessions or seminars. 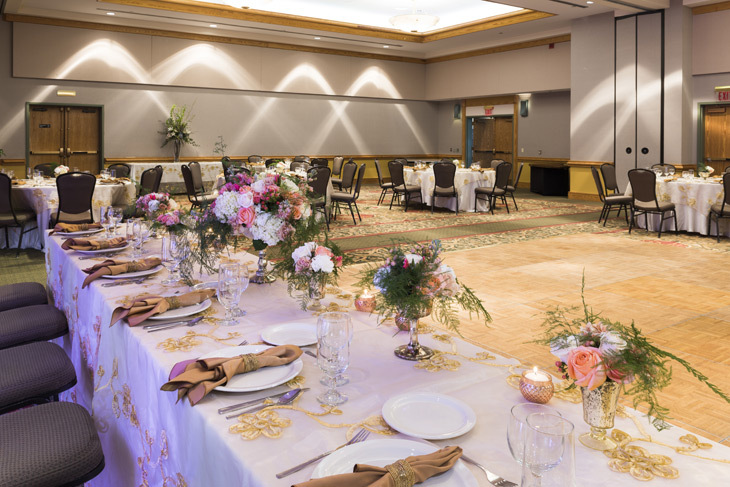 If you are planning a more intimate gathering, our 1,560 square foot Trail Ridge room and the 770 square foot Lake Estes room can accommodate groups ranging from 18 to 170. If you are interested in holding an event outdoors, then you are in luck! 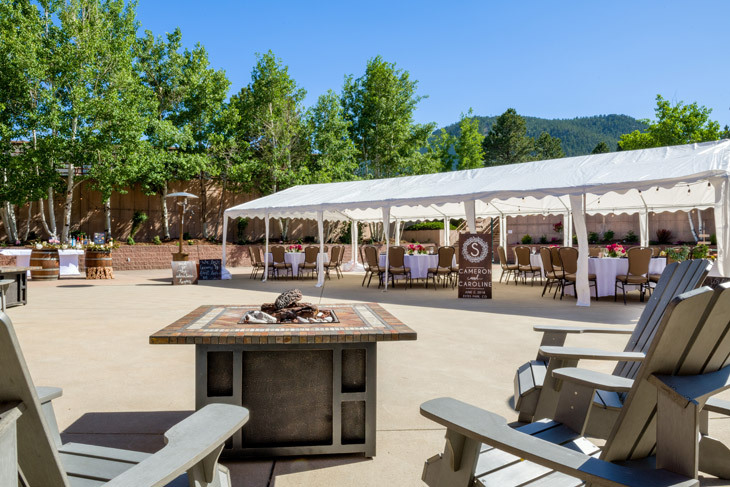 Our 5,600 square foot Aspen Courtyard is located adjacent to the Grand Ballroom, where we have a large event tent that can be set up to provide a covered seating or reception area. A number of gas fire pits can be set up as well, circled by Adirondack chairs to give your attendees a comfortable place to sit and chat, and our professional catering staff is more than happy to service outdoor events if you are interested in having a meal or reception under the stars. We might be located at the foot of the Rocky Mountains, but there is nothing rocky or uncomfortable about our guestroom accommodations! 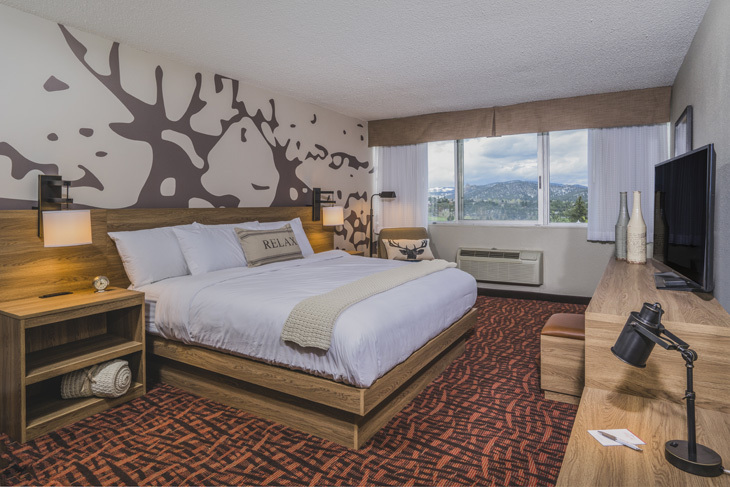 The Ridgeline Hotel’s 147 guestrooms and suites have all been recently refreshed or remodeled with your comfort in mind, and are directly connected to the Estes Park Conference Center, providing ease of access for your attendees. Each and every guest will enjoy in-room amenities such as complimentary WiFi internet access, 50-inch flat screen cable TV, clothes steamer, blow dryer, individual room climate control, and more. A number of upgraded rooms are also available, featuring mini-refrigerators and microwaves, as well as a variety of suites, ADA rooms, and pet-friendly rooms. Complimentary coffee service is provided daily in the lobby. 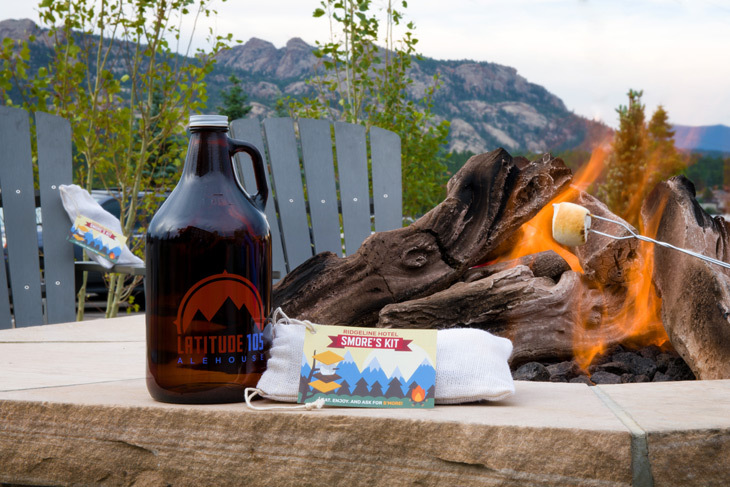 As a guest of The Ridgeline, your attendees will also have full access to our wide range of on-site amenities, including our indoor heated swimming pool and hot tub, our complimentary game room, fitness center, complimentary bicycle rentals, as well as our new outdoor fire pits where you can roast S’mores under the beautiful Colorado night sky. 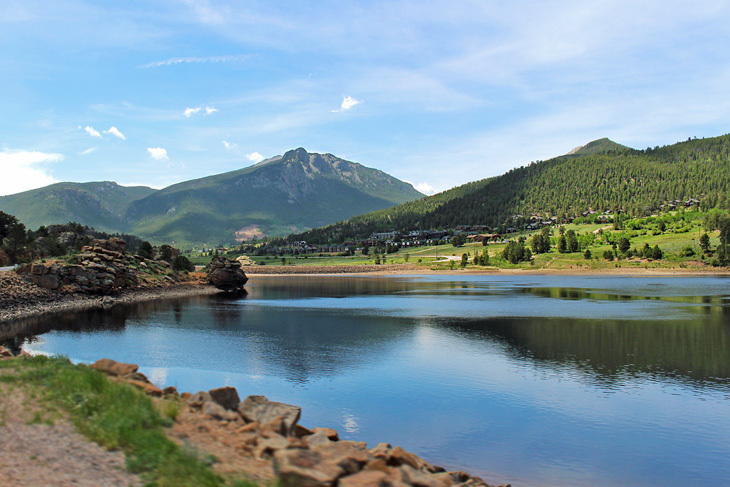 Tours of Rocky Mountain National Park also leave directly from the hotel in our 15-passenger convertible bus, which can be reserved for your group as a private tour! Are you looking for a beautiful, convenient, and affordable wedding venue near Rocky Mountain National Park? You have come to the right place! The Ridgeline Hotel in charming Estes Park, CO, can make your dream Rocky Mountain wedding a reality. Our friendly and knowledgeable event staff can assist you every step of the way, from coordinating your ceremony and reception, to helping select the perfect local florist or photographer. 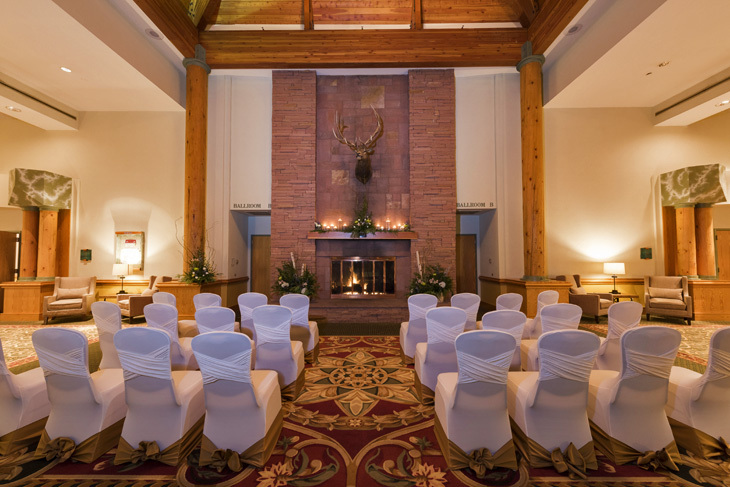 Ceremonies can be held in front of our Front Foyer Fireplace, or outdoors in our popular Aspen Courtyard, or you can choose from a number of ceremony locations within Rocky Mountain National Park and then bring the party home to Ridgeline where we do receptions in style. 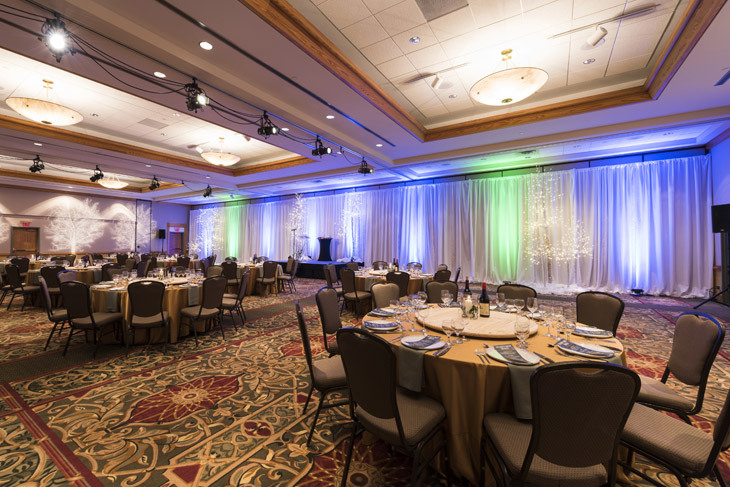 Our 8,000 square foot Grand Ballroom is directly attached to the hotel, and can accommodate up to 400 guests for a banquet setup, or we can set up our event tent in the Aspen Courtyard to provide covered dining for up to 250 guests in the fresh Colorado mountain air. A variety of packages are available that include chair and table setup, bartender, cake cutting, dance floor, champagne/cider toast, ivory or black linens, complimentary use of centerpieces, and a pre-wedding tasting for two. Additional accessories are also available. 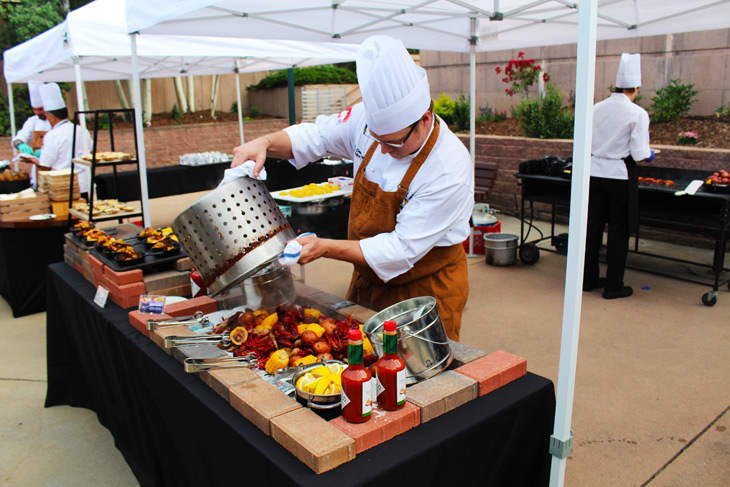 When it comes to catering, our award-winning Chef and culinary staff pulls out all the stops, serving up delectable cuisine to satisfy every palate. A range of crowd-pleasing buffet options are available, as well as a wide variety of elegant plated dinners, putting the perfect finishing touch on your wedding day. With options ranging from Chicken Parmesan to Filet Mignon, and Seafood Trio Primavera to Italian Chef Salad, rest assured nobody will be going hungry. Cocktail and Bar Service can also be arranged, and our attentive bar staff will be on hand to serve your guests a variety of wines, spirits, and domestic and imported beers. For more information, or to begin planning your dream wedding, please call us at 970-480-4012 or send us your contact info with a Request For Proposal, and our professional event staff will get right back to you.